For this exercise I was determined to get outside and draw so I took a few objects with different surfaces onto the balcony and tried them in different compositions. 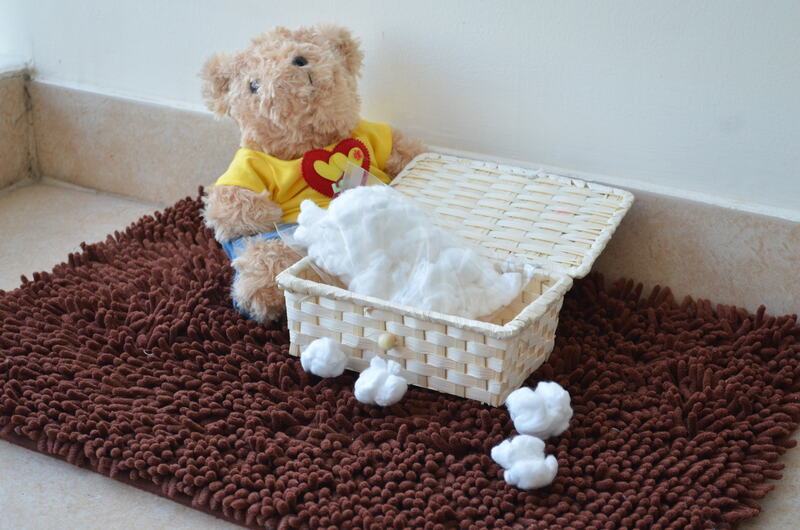 Originally I planned to use objects that I used in the ‘Experimenting with Texture‘ exercise and what I had in mind was a reel of red and white string, a Siamese football, a mesh dishcloth, mop mitten and a teddy bear so moved them around in different composition to see how they looked. After much thought I headed down to the shop to buy some money type bags and cotton wool and came up with the following composition. 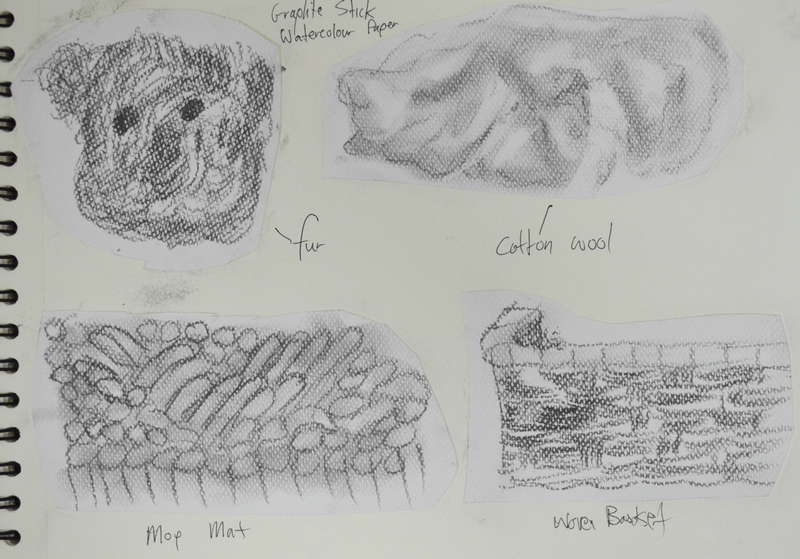 Because of the texture of the mop mat I chose graphite stick on watercolour paper to complete this exercise and started out with some more experimenting to see how each object would look. I must have not been myself that day because I did a quick sketch of each objects texture with a soft graphite stick and thought everything looked great so grabbed my drawing board and went ahead with the drawing. I wasn’t too worried about perspective as it was about depicting the texture rather than anything else. The drawing took me no time at all and when I had finished I packed up, confident that I had done great. 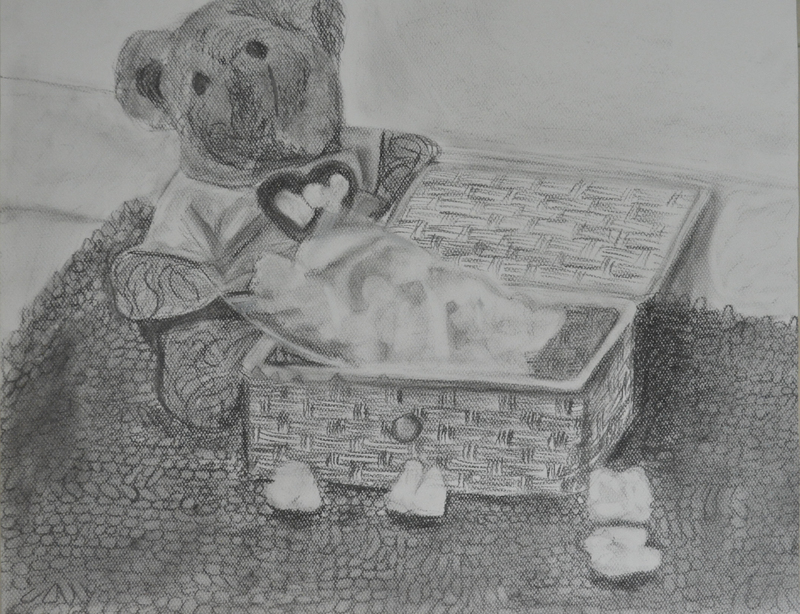 I must have been in some kind of trance because when I woke up the next day I looked at again and realised not only did the drawing look awful but was too smudged and I had done a bad job in depicting any texture that was in the composition apart from the woven basket. So I made the decision to change the medium and the paper and start again. 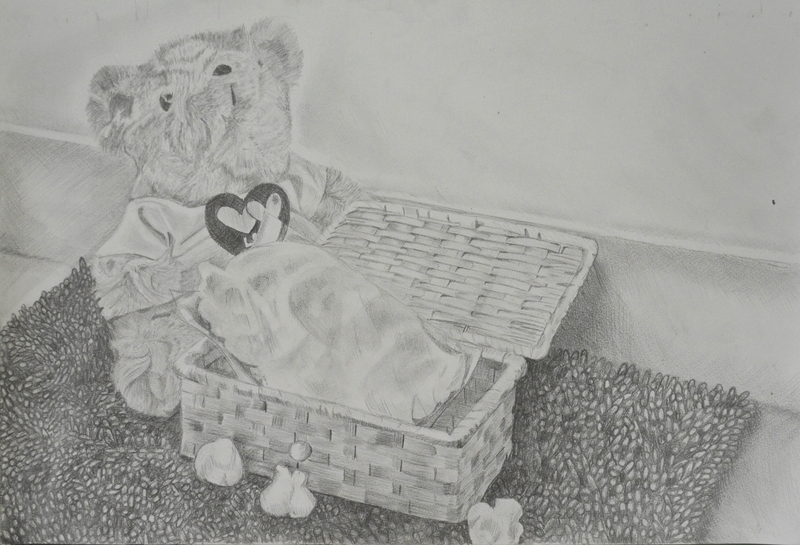 This time I did something I had never done before, instead of drawing everything first and then going over it again with texture and detail the only thing I drew in advance was the shape of the bears head and completed the rest of the picture stroke by stroke, The drawing took me quite a few hours and due to not drawing the outlines of the objects first the perspective was off but again I wasn’t too worried about the perspective. I changed the length of the mat as it did get a bit tedious but I am happy I got to show the depth of the mat, my only regrets are 1, that I didn’t get to do the drawing in a different medium such as pen and 2, I didn’t leave the cotton wool in the plastic bag the colour of the paper instead of trying to use a white medium which got a bit messy as I tried a few on the actual drawing before using fixative and going over in white pastel which still looks cream.